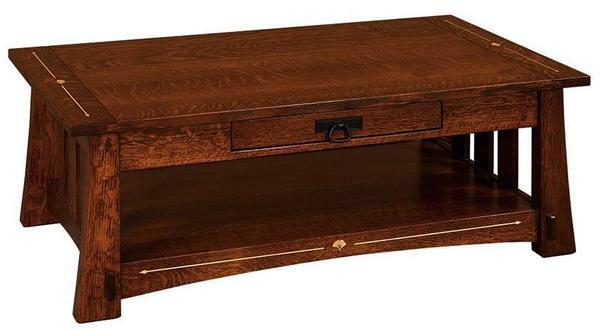 Defined by its transitional style and the true American integrity that runs through its every inch, the Mesa Mission is a handmade coffee table that masterfully blends durability and classical, refined beauty. Each piece is built by hand and to order in a small Amish woodshop in the northern United States by dedicated craftsmen who share a deep belief in the virtue of the simple thing done well. This coffee table is ready to redefine the space around it, raising the benchmark for all other coffee tables with its solid wood construction and flawless, meticulous hand-sanded finish. Taken as a whole, this really is an exceptional table. Your Mesa Mission will be handcrafted to order in your choice of wood and stain, leaving plenty of room for customizing this piece with personalized dimensions or features. If you'd like to talk about crafting a custom coffee table - or if you have any other questions at all - please don't hesitate to get in touch by phone or by email at any time. We love the irresistible elegance of this piece, and we would love to talk with you about the heirloom-quality beauty that it brings to the home.